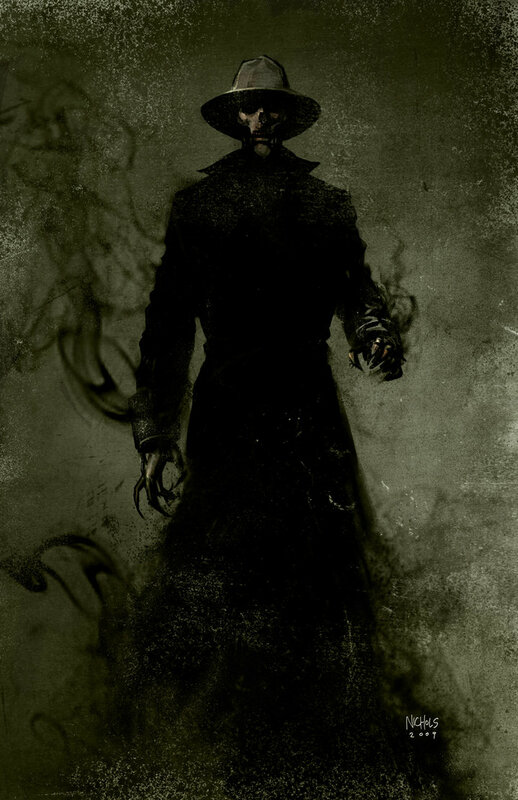 I don’t think I’ve told you about the Shadow Man and his ghosts. They are a frustrating bunch. It’s impossible to talk to them. I mean, I talk but they never talk back. I guess it’s because they can’t. Shadow Man is a master of implications, though. What he refuses to or can’t say, he conveys through symbols. His realm always brings me to the Cemetery on the Outskirts of Town. It’s never the same cemetery but it’s always the same pattern-wise. Thus the name of the Cemetery on the Outskirts of Town. You see? Anyway, one time I was in the cemetery and I was groping my way amongst the tombstones waiting for Shadow Man to appear when I came across a grave marker that had the name of “Samuel H. Redding, MD” on it. I gazed upon it and then Shadow Man rose over it. He then led me to another grave where the tombstone had fallen over and I stood over it and looked down. On its surface was etched the face of a Ouija board. And I understood that he wanted me to ask. The wooden, heart-shaped planchette began to move: S – A – M – E – A – S – Y – O – U. Again it moved to “Yes” but then it spelled: W – A – N – T – S – T – O – K – I – L – L – K – I – N – G.
But he didn’t answer. Instead a chill wind stirred the trees and Shadow Man fled. And that’s when I decided that Dr. Redding must die. Dr. Frankenstein loves to sing the Dies Irae – or, I should say, he loves to sing the first line and then he just hums the rest. I guess he has forgotten the words after “Day of wrath and doom impending”. He loves to watch his golems torment me too. I usually get to hear an earful of his humming before the chase ensues. And so now I must act quickly or else the City and all of Nod will fall.